Will you be an evil or benevolent deity? From the creative mind of god game developer Peter Molyneux comes Black & White 2, the sequel to the critically acclaimed hit Black & White. In this strategy game, you reprise your role as a powerful deity in search of a following and return to the once idyllic world of Eden, where the discovery of weaponry and warfare has tainted the beautiful landscape. With the help of your gigantic Creature that you raise from infancy, you must earn the respect and worship of the natives. How you choose to do that, whether through nurturing them or terrorizing them, is up to you. The player will have many choices to make in Black & White 2. Once you and your creature have convinced the people that you are a god, you then have to decide if you are going to care for your believers, building them huge cities that are beautiful and safe, or if are you going to rule the land causing death and destruction by leading vast armies into battle. As players enter this warring world they will have the option to make tribes coexist peacefully, encouraging villages and towns to grow into metropolises, or prompting them to inflict their will upon others by creating and commanding large armies that seek to dominate and conquer. You have a Creature to do your bidding and train as you will, and you may rule over your people as you wish. This evolved Creature can help you nurture their communities grow into huge, towering cities. Or you may use death, suffering and fear. The Creature has been massively advanced since the original Black & White, and now has a vital role as a military leader and command unit. He can learn strategies, lead armies into battle and is the ultimate battlefield weapon himself, armed with many powerful new attacking and shielding Miracles. The epic world of Black & White is yours for the asking. But remember—if you want peace, prepare for war. Wage massive wars, sieges and battles or use your skill and power to keep the peace. 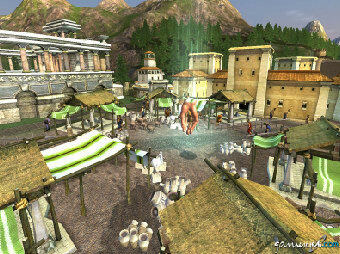 Discover and use new Epic Miracles, including the ground-ripping Earthquake and volcanoes, which cause rivers of lava. Choose and customize the Creature that's right for you from a selection, including old favorites as the Ape, Cow, and Lion, plus many others. Research and create new forms of weaponry, from swords to bows to siege machines. Build and design unique defensive gates and walls. Control and marshal huge and varied armies. Create and control settlements that include housing, farming, and many other buildings like fountains and lush gardens (if you're Good) or stocks and guillotines (if you're Evil). Use multiple tools to help train and improve Creatures. As well as sticks, whips, feathers, players can create their own unique tools. Weather systems such as rain, snow, mists, and fog. Journey through 10 lands homing each of the five tribes.